How are ankle sprain treated? 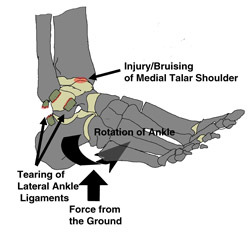 The ligaments most often involved in ankle sprains are the anterior talofibular and calcaneofibular ligaments. 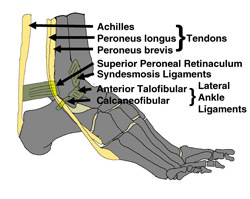 The syndesmosis ligaments are involved in an ankle sprain variant often called “the high ankle sprain”. Ankle sprains are one of the most common athletic injuries and usually affect the ligaments on the outside of the ankle. A sprain is an injury to the ligaments, the connective tissue that helps to hold the bones together across a joint. The severity of the injury can vary from stretching and inflammation to a complete rupture. The signs of an ankle sprain are pain, weakness, swelling, and bruising along the ankle. They can be as painful as any fracture and can be very difficult to walk on. It is important to separate these injuries from other injuries of the ankle that may not heal by themselves or be dangerous to walk on. A thorough physical examination, in addition to proper x-rays, is usually necessary. The ankle sprain usually involves a rolling or eversion of the ankle which may injure other structures besides the ankle ligaments. Initial treatment of even severe ankle sprains is non-operative. Rest, ice, elevation, immobilization and pain medication are begun. Sometimes, when the pain is severe, a short period of casting may help with pain control. Therapy can be started when the pain and swelling allow. Motion and gentle strengthening exercises should progress to balance, and even sport specific exercises as one recovers. Various braces including lace-up braces, stirrup braces (such as the Aircast), and walking boots may help protect the foot. 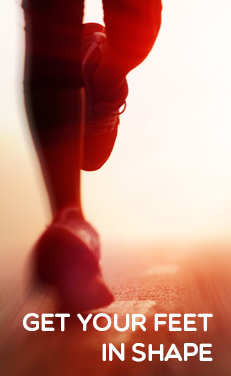 Along the recovery, clinical tests can determine if any permanent damage or stretching to the ligaments have occurred. If recovery does not progress as anticipated, further diagnostic testing are evaluated to exclude other injuries. Surgical treatment of ankle sprains is required if continues instability (inability to trust the ankle) is experienced. Generally, surgical treatment involves repair of the ligaments. If the ligaments are so damaged as to make repair impossible, then reconstruction using local tendons can be considered, but adds significantly to the recovery and extensiveness of the surgery. The procedure is done as an outpatient. Immobilization in a cast occurs for two weeks and protection and rehabilitation continues for about four additional weeks. Complications included continued instability, nerve damage, ankle pain, and wound problems.